The Franco-British exhibition was a large public fair held in London between May 14th, October 31st, 1908. This exhibition attracted 8 million visitors, and it covered an area of over 140 acres. The most popular attractions at the exhibition were the two so-called “colonial villages”, the “Irish village” and the “Senegalese village”, which were designed to show the success of imperialism. 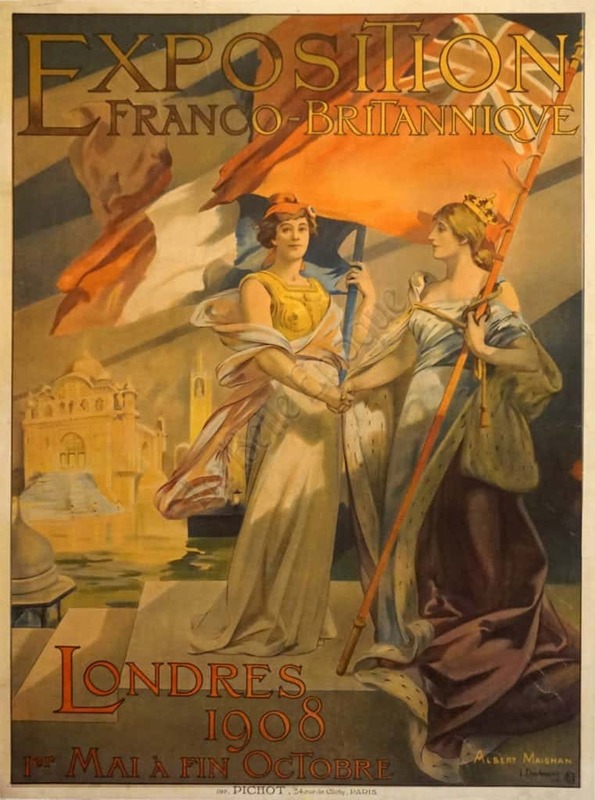 The poster shows two women shaking hands, one with the British flag, the other with the French flag. If you’ll notice, the women are not modern for the time, the English woman appears to be a young Queen Victoria, & the French woman appears to be wearing armor. In other words, this advertising poster was made to look like a romancing of the past Queen of England making a peace offering with the rivaled French. The poster is filled with earth tone colors; oranges, yellow, lime green, and plum throughout the poster.